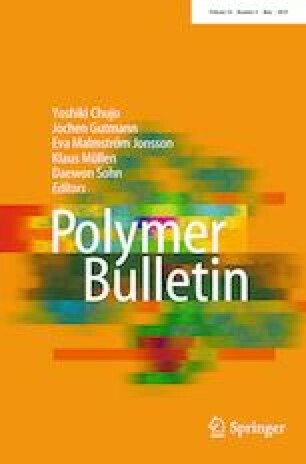 Biocomposites of poly(γ-glutamic acid) (PGA) were prepared by a two-screw extruder using chitosan (CS) as the block with glycerol and with/without water and acetic acid as additives. The influences of the CS content and various additives on the properties of PGA/CS blends were investigated. The results of mechanical tests demonstrated that the elongation at break of the blends decreased with increasing quality proportion of CS. Fourier transform infrared spectroscopy revealed that there were ionic interactions in the blends. Thermodynamic characterizations and dynamic mechanical analyses indicated that the glass-transition temperature of the blends decreased with increasing CS proportion and was obviously influenced by additives. X-ray diffractograms indicated that selecting a suitable solvent is beneficial to the blending of raw materials. Morphology analysis showed that the two kinds of substrates exhibited different miscibilities under different conditions. In addition, the antibacterial activities of the blends against Escherichia coli were not obvious because of their limited solubility. Therefore, the PGA/CS blends appear to have potential as a new biomaterial. The online version of this article ( https://doi.org/10.1007/s00289-018-2485-9) contains supplementary material, which is available to authorized users. The authors would like to acknowledge financial support from Foreign Expert Project of National Foreign Special Office (GDW20143300151).